↑ Avery, Mary Ellen (2008). "Gertrude Belle Elion. 23 January 1918 -- 21 February 1999". Biographical Memoirs of Fellows of the Royal Society. 54: 161–168. doi:10.1098/rsbm.2007.0051. ↑ Holloway, M. (1991) Profile: Gertrude Belle Elion – The Satisfaction of Delayed Gratification, Scientific American 265(4), 40–44. ↑ McGrayne, Sharon Bertsch (1998). 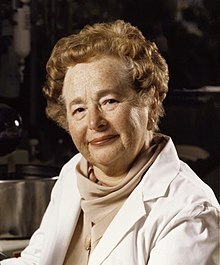 "Gertrude Elion". Nobel Prize Women in Science. Carol Publishing Group. pp. 280–303. ↑ Bertha and Gertrude Elion | Jewish Women's Archive. Jwa.org. Retrieved on May 12, 2014. ↑ Elion, Gertrude. "Les Prix Nobel". Nobel Foundation. Retrieved February 21, 2014.